The good: Near airport Excellent restaurant - open late Attentive staff Allowed us several days luggage storage with no cost (on basis we would stay again when we returned to Delhi) The bad: First mile from hotel to airport has jammed up traffic most of the time, meaning it can take long to get to the airport even though you are close. Overall, I would check other options for airport hotel before staying here again. The rooms property is good in size and rooms are okay. But everything, and I mean everything, was under maintenance. The spa, swimming pool, sauna, club room, bar etc. Could not enjoy the stay due to lack of more than 90% of the amenities stated at the time of booking. Even the restaurant refused to serve every item we asked for except a couple. We had to order the food from Swiggy multiple times. Thanks to the location that Swiggy had many good options nearby. Two things that came as a total shocker - no tooth brush in the toiletries and when asked for it there was a plain reply 'we don't have it here, but can get you one from some shop nearby'. The second one - no scotch glasses. When asked for it, once again a plain reply, 'we don't have it here'. A four star property saying so just doesn't look good. The place is more suited for wedding arrangements. Even didn't get a buffet breakfast. Though, whatever little they served from the restaurant, the food tasted good, not sure if it was cooked inside or got from the nearby markets. Would not recommend unless someone is looking for a stay near airport and couldn't find any other. A nice hotel, it's main advantage being just a few miles from the airport. The gardens and grounds lovely. Our room. (118) has no wifi, you can usually get sick of you sit in the lobby. Lovely outdoor pool. Water in the room never got hotter than tepid. Restaurant good, you will eat there a lot, as there are no other restaurants nearby. Staff were fine. Facilities in room good, flat screen, many channels, tea/ coffee, safe, Nice place to spend a night going to from Delhi airport, but a long way from anything else. Good location, close to the airport. Clean rooms. This property was good for its purpose, after traveling for over 20 hours and grab some sleep and rest between flights. It is relatively close 15 minutes from airport and for the money a good value if you are looking for a place to crash without paying airport hotel prices. Stayed at this hotel for 5 hours whilst waiting for my next flight, as it was close to the airport. Very disappointed with the hotel. The hotel is old and run down and in major need of restoration. The rooms are dark and musty. The bathrooms are mouldy. Walls are grubby and in need of a paint job. The room service food was terrible. Chips that look as if they were a week old and arrived cold. Plastic cheese and browning salad. Tried to sleep but with the noisy ancient aircon, rock hard bed and the loud echoing corridors it was impossible. 1250 INR for airport pick up or drop off. Not when cabs are 250 and uber is 150. Don't waste your time or money on this hotel. What "A shocker". the hotel is real heritage with all their equipment and heritage smell aswell. If you want to use gym be prepared for the worst, nothing worked there. Pool?Rather not, thanks. Expensive restauarant, small kit kat bar costs 100 INR. Transfer to the airport 1000 INR though normal taxi just 250 INR. No other option to go somewhere. I can tolerate all this things for low price hotel, but it wasnt even that cheap. Stayed here after reading many positive reviews and found it a nice place to spend a day in peace. Fooding ordered was awesome in taste. Room was good . The problems we face there . First there lighting system in the room . Either it can be full dark or some bright lights just above our head in the night. Second Our toilet jet was not working properly , it seems that was unused from quite a long time . Apart from this Everything was good . Certainly would love to stay there again . The peaceful gardens, the food and the location. We were looking for an hotel with a local flavour reasonably near to the airport. 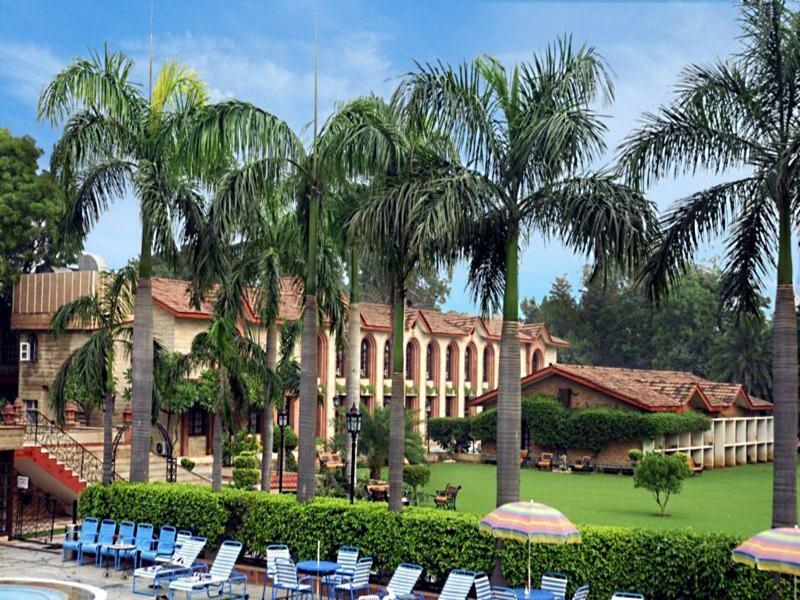 The Ashok Country Resort fitted are requirement perfectly being set in lovely gardens with an excellent swimming pool. We received a very warm welcome from all the staff and even the owner himself, and we enjoyed every meal as the food was excellent. This hotel proved to be a first class alternative to the usual worldwide hotel groups which are comfortable but lack individuality. Overall, we are pleased with the hotel. Staff is friendly and goes out of the way to satisfy. It is older hotel but it is clean, and room has everything needed including hair dryer and hot water kettle. Window views are overlooking the garden - hotel build this way, it is more a boutique hotel, with not too many rooms, which I liked - it is not noisy and not too many people. One thing I didn't like about the rooms were windows. They are one panel windows, and they are not sealed well. But the room was cold,and A/C worked well. Unfortunately, we came to Delhi in the middle of the dengue fever outbreak, and that issue with windows kept me worried. I took some toilet paper and knife and stuck some paper into the seams and it solver the issue of mosquitoes possibly getting into the room. Hotel provided us with the mosquito repellent, which was very nice of them. Dining was excellent, and we did not get food poisoning, so it is safe to eat there. Cousine is mostly vegetarian, tasty, which was good for us, vegetarians. Some meets were offered too, not significant variety. I think its great to be able to taste and get acquainted with local food & spices in safe condition inside the hotel. The man at the help desk named Raisai ( maybe I spelled it wrong) -was very nice and professional. I needed astrologer and he went out of his way to find us a true, good one. overall the hotel deserves 4 stars in my mind. 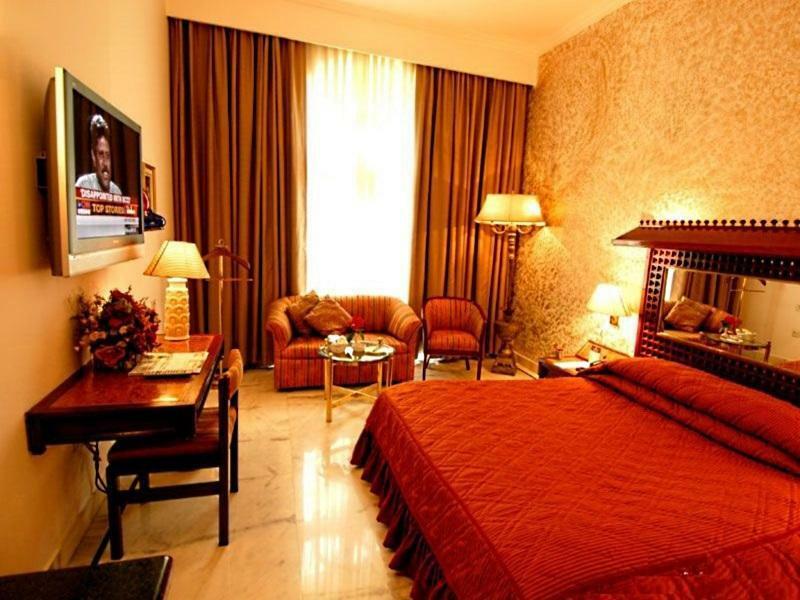 It is rated as 3 stars , but for India in comparing with other places, it fits easily into 4 star hotel plank. Good value for the money spent. Convenience to airport yet very quiet. Excellent staff and service. Beautiful facility and pool. Fantastic! I was in india for 3 weeks and had stayed in some very loud places that were not clean and even had water problems (wet mattresses/rooms/no working fan). This was a spectacular place to rest. I would love to return there! I had an overnight in Delhi between flights. The hotel had good amenities and was a great place to unwind. The pool was very nice, not crowded, and the overall setting was very peaceful. I didn't know what to expect when booking this based on reviews from the internet, but was pleasantly surprised. We were thrilled by the setting of this hotel, close enough to the airport for an easy stop-over, yet quiet and in green garden setting. Cool marble floors throughout, dark wood furniture with a moghul feel to it. Large comfy bed with well stocked bathroom. Outside green lawns and a very clean swimming pool with an attendant to bring you towels.There is a peacock that frequents the garden. The restaurant has good food and very helpful staff.Very good value for money. Quite close to the airport, great grounds, quiet. Comfortable spacious room. Only challenge is that the property is not in proximity to any shops but this also gives it the quiet almost country atmosphere. Is a decent hotel closer to Airport. Location is convenient, but does not have any shops or things close by. Have to take a cab to get to anywhere. Was given ground floor room after waiting all morning as i arrived at 8AM and they only allowed me to check in at 12nn. Breakfast was basic and quality was average. for the price might consider staying but wouldnt be my first choice. We only stayed for one night between flights. About half an hour from/to the airport. The room was spacious and clean and the restaurant and bar were both good, though the prices were a bit too high. We arrived after dark, so didn't have the time to test the pool or see the garden properly. The staff is really professional and helpful, though the ride to airport cost 1000 rs compared to the official taxi booth price from the airport (250 rs). Nice stay anyway!